This whole tradition started when I was at the 2001 IJA festival in Madison. I was trying to hit my 3 box pirouette to foot catch trick, which is a total pain in the behind. Jeff Daymont, the acknowledged Godfather of Cigar boxes, walks by and sees what I'm trying to do. He stands there for a while and then remarks, "I'll give you a buck if you can hit that." Well...finally...l hit it. So Jeff gave me a dollar, which I then asked him to sign. Click for the full image. 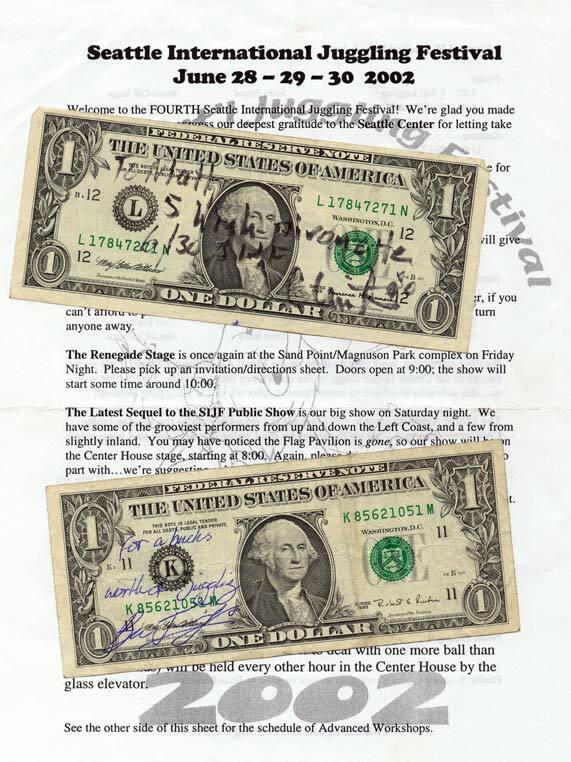 I scored my next two dead presidents at the 2002 Seattle International Juggling Festival. The day of the public show, Ben Jennings, Jonathan Root and Bill Berry were practicing on the floor and I borrowed Bill's clubs for a second. I use 95mm Renegades and he was using 85mm Renegades at the time. I started trying at two-stage pirouette with 3 clubs--the first two on singles and the last on doubles. Once again, Ben Jennings saw me get close and said, "I'll give you a buck if you make it." He knew the story of the first dollar bill, so I suspect he was taking the piss....well...finally...I hit it. Later, as the festival was ending on Sunday. Clinton Holzhauer and Ben and myself were walking out to the parking lot. We were all dead tired, but we had to stop and wait as Ben had to go back and get a forgotten item. While we were waiting I started messing around with 5 balls and I told Clinton about my bet with Ben. Clinton immediately challenges me to get a 5 ball 5-up pirouette. Well...finally...I hit it. Actually, I got it on the first try, which for me at that time was a big deal. Here are my two lovely greenbacks. 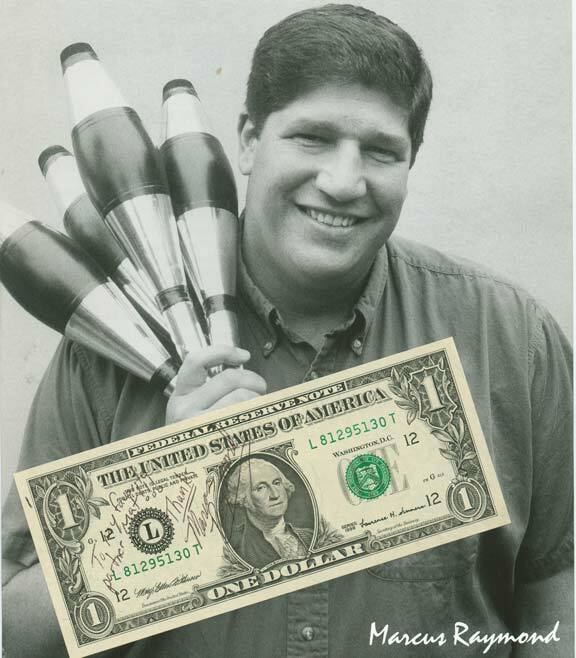 Ben's Dollar says, "For a buck's worth of Juggling" Click for the full image. My final bit o' cheddar came when Lisa and I went to San Francisco one night for dinner. We decided to go to Pier 39 to see if we could catch a juggler or some busker in a show. As it turns out, Marcus Raymond, a local performer, was just finishing his last set of the evening. Afterwards, I walked up to him, introduced myself, and started fooling around with a few of his props. People saw two jugglers on stage and started gathering for another show. Marcus whispered to me, "Hey, you want to do a quick show? I'll give you half the hat." I said sure, and off we went. It was the first time I had ever worked with a partner, done comedy (actually, Marcus was cracking most of the jokes, and I was just playing the stiff straight man), or passed fire torches. 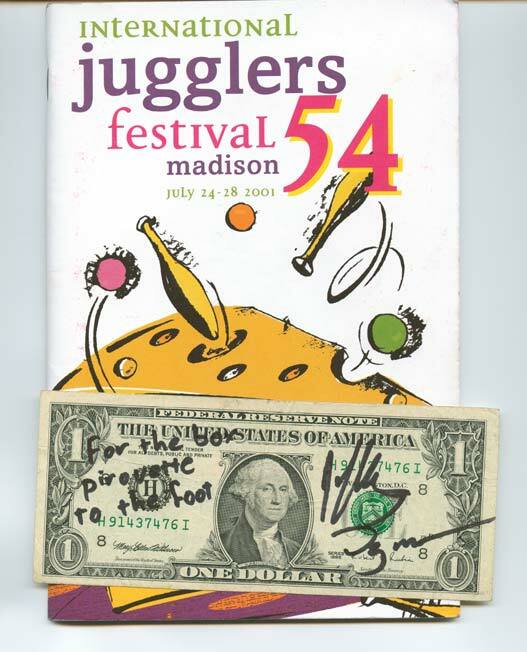 We ended up making a few bucks, but I turned the money down and just asked Marcus to give me a signed dollar bill. Marcus's Dollar says, "To my favorite partner, Matt" Click for the full image.